I don’t know how many times I’ve listened to the latest from this Salt Lake City black metal foursome. While the six tracks from the self-titled record may not stick in my head, they are great black metal listening. With the almost two week’s time I’ve had the record and played it, there is a reason the songs don’t stick. It’s just one of those albums you can’t fully absorb quickly, which is a great thing for any album to have (for me, at least). It means that repeated listening is a must. I’ll listen and then listen again, finding things I didn’t notice before. 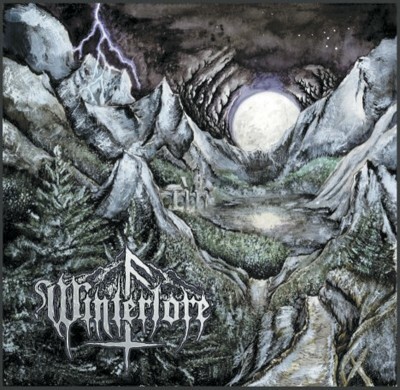 The black metal style of Winterlore is far from the typical American style, which, at the moment, is a good thing, because most American black metal bands are spinning it by adding extra genres into the mix. When I listen to Winterlore, I think of Sweden or some other Scandinavian country. Much of the songs are midtempo, though not for lack of songs with blazing, faster material, either. The first track, “…In the Frozen Forest,” starts out fast as hell, and “Marching Hordes on Warpath’s Old” is definitely a high-speed listen. There is a magnificent scope and an almost epic dynamic to the album—something broad and amazing. I try to come up with comparisons, and other than the band equation, nothing much comes up. Winterlore’s first album, Four Swords Against the Pious, used many other elements than the guitar/bass/drums/vox, including a jaw-harp, but here, the extra elements are minimal. There is some flute use, but the chanting vocals on this new release add that grandiose, “Listen to me again and again” element.